The Canadian pop star introduced his new hamster PAC to fans on Twitter in October and revealed his pet was accompanying him on his Believe world tour. But Justin, 18, came under fire from animal protection organisation the CHA after a video recently emerged on the internet of him giving his pet away to a fan while signing autographs outside the Jingle Ball in Atlanta, telling her "You gotta take care of PAC." Last week a spokesperson for the CHA told gossip website TMZ.com: "[Hamsters] often succumb quickly to illness and death [when faced with] sudden environmental change. The moment that hamster was handed off to a screaming girl in a harsh, frenzied environment was likely the moment it gazed at the short path to its doom." But PAC's new owner, Victoria Blair, has come forward to reveal he is doing fine. She told Celebuzz.com: "I worship that little hamster - I love him. He's fine. He sleeps during the day and plays at night - he's acting like a normal hamster. "I bought him a ball and he runs around. He stays right beside my bed. He'll wake me up and roll around. The next big thing I'm going to get is a hamster playground." And the California Hamster Association have backed down on their criticism of Justin giving his pet away. 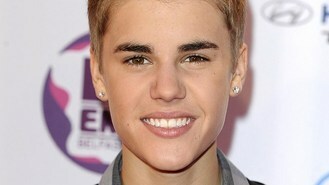 A spokesperson told Celebuzz.com "We have no ill will toward Mr Bieber. "Our understanding is that owing to the way [Blair] received the hamster and from whom, the recipient is apparently doing her best to do right by the animal, and for that I suppose we could actually thank Mr Bieber. But... in most cases the situation would almost certainly turn tragic."